President Trump's budget for Reclamation shows his strong commitment to our mission of delivering water and generating hydropower in the West. Today, President Donald Trump proposed a $1.049 billion Fiscal Year 2019 budget for the Department of the Interior's Bureau of Reclamation. The budget supports the Department's goals of ensuring the provision of secure and reliable water supplies, the efficient generation of American energy, celebration of America's resources and recreational opportunities, and fulfilling commitments to tribal nations. 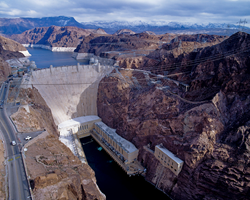 Reclamation is the nation's largest wholesale water supplier and second-largest producer of hydroelectric power; its projects and programs are an important driver of economic growth in the Western states. Reclamation manages water for agricultural, municipal and industrial uses, and provides flood risk reduction and recreation for millions of people. "President Trump's budget for Reclamation shows his strong commitment to our mission of delivering water and generating hydropower in the West," Commissioner Brenda Burman said. "The request also highlights how critical Reclamation's facilities are to the nation's infrastructure while also supporting tribal nations." Reclamation's budget is offset by current receipts in the Central Valley Project Restoration Fund of $62.0 million, resulting in net discretionary budget authority of $987.0 million. Of this amount, $891.0 million is for Water and Related Resources, $61.0 million is for Policy and Administration, and $35 million is for California Bay Delta. Permanent appropriations in FY 2019 total $101.0 million. The funding proposed in Reclamation's FY 2019 budget emphasizes Reclamation's core mission of reliable water delivery and efficient hydropower generation to address the water demands of a growing population; and to assist states, tribes and local entities in solving water resource issues. It also emphasizes investment in modernizing existing infrastructure -- beyond the operation and maintenance of Reclamation facilities -- in a safe, economic and reliable manner, ensuring measures are in place to protect the public and Reclamation facilities for the next 100 years. Reclamation's dams, water conveyances and power generating facilities are critical components of the Nation's infrastructure. The safety and reliability of its dams is one of Reclamation's highest priorities. The Dam Safety Program is critical to effectively manage risks to the downstream public, property and natural resources. The budget request of $88.1 million for the Safety of Dams Program provides for risk management activities at Reclamation's high and significant hazard dams where loss of life or significant economic damage would likely occur if a dam was to fail. The budget also includes activities for several dam safety modifications, as well as for Interior's Dam Safety Program, which Reclamation oversees. Furthermore, the proposed budget includes $45.0 million for various projects for Extraordinary Maintenance (XM) activities across Reclamation. Reclamation's XM budget is part of its overall Asset Management Strategy that relies on condition assessments, condition/performance metrics, technological research and deployment, and strategic collaboration to continue to improve the management of its assets and deal with aging infrastructure challenges. Significant additional XM items are directly funded by revenues, water and power customers, or other federal agencies. Reclamation's projects and programs support tribal nation efforts and Native American programs. A total of $127.4 million in funding is requested for Indian water rights settlements. This includes $69.6 million for the Navajo-Gallup Water Supply Project, $12.8 million for the Crow Tribe Water Rights Settlement, $8.3 million for the Aamodt Litigation Settlement, and $10.0 million for the Blackfeet Water Rights Settlement. Other efforts to support tribal nations are long standing and range from species protection to rural water projects. This budget request continues to support water delivery and quality concerns that address the special requirements in the Colorado River basin and in the state of California. While last year's precipitation was beneficial, the long-term impacts from droughts are not recovered in a few wet years. Groundwater must be replenished and the hydrologic system will need time to recover. The FY 2019 budget request through programs, such as the Lower Colorado River Operations Program ($31.2 million) and the Central Valley Project ($147.5 million), continues efforts to find a long-term solution to achieve a reliable water supply and quality for both areas. The FY 2019 budget request supports and emphasizes activities designed to prevent and combat the infestation of quagga and zebra mussels across Reclamation states. These invasive species are rapidly reproducing and have infested multiple operational areas of Reclamation facilities. Research is continuing to find ways to impede the mussels' populations, and funding will support, in cooperation with the Western Governors Association, Reclamation activities established in the Quagga-Zebra Mussel Action Plan. This includes working with states and tribes to keep mussels from infesting the Columbia River Basin in the Pacific Northwest. Central Valley Project Restoration Fund - The budget of $62.0 million is expected to be offset in total by discretionary receipts, which are adjusted on an annual basis to maintain payments totaling $30.0 million (October 1992 price levels) on a three-year rolling average basis. The budget for the CVPRF was developed after considering the effects of the San Joaquin River Restoration Settlement Act, which redirects certain fees, estimated at $2.0 million in FY 2019, collected from the Friant Division water users to the San Joaquin Restoration Fund. Desalination and Water Purification Research Program - This program supports desalination research, development and demonstrations for converting unusable waters into useable water supplies. The FY 2019 request of $2.9 million supports projects in the laboratory-scale research studies, pilot-scale testing and full-scale testing. Funding also supports the operation and maintenance of Reclamation's Brackish Groundwater National Desalination Research Facility, which supports testing projects and potential work from Cooperative Research and Development Agreements, including one focused on produced waters from oil and gas extraction activities. Science and Technology Program - The FY 2019 request of $11.0 million supports water and power technology prize competitions, technology transfer, and dissemination/outreach activities addressing critical water and power management obstacles. The S&T Program also supports the monitoring, detection and control of invasive mussels. The Site Security program - The budget request will continue Reclamation's ongoing site-security program at $26.2 million, which includes physical security upgrades at key facilities, guards and patrols, anti-terrorism program activities and security risk assessments. WaterSMART Program - Endorsing Theodore Roosevelt's principles of land and wildlife conservation, Reclamation strives to ensure future water delivery through the conservation of the resources available now. The funding proposed in Reclamation's FY 2019 WaterSMART budget ($19.9 million) supports Reclamation's collaboration with non-federal partners in efforts to address emerging water demands and water shortage issues in the West. To view the budget request for Reclamation, see http://www.usbr.gov/budget.